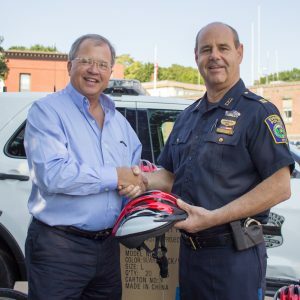 Attorney David White delivered 100 children’s bicycle helmets to the Everett Police Department earlier this week. He got a warm welcome from Everett Police Captain Richard Basteri, Lt. Mark Zielinski, Officer Joe Gaff, Officer Jeff Gilmore and Detective Jason Leonard. Breakstone, White & Gluck donated the helmets as part of our Project KidSafe campaign to keep children safe while riding their bicycles. 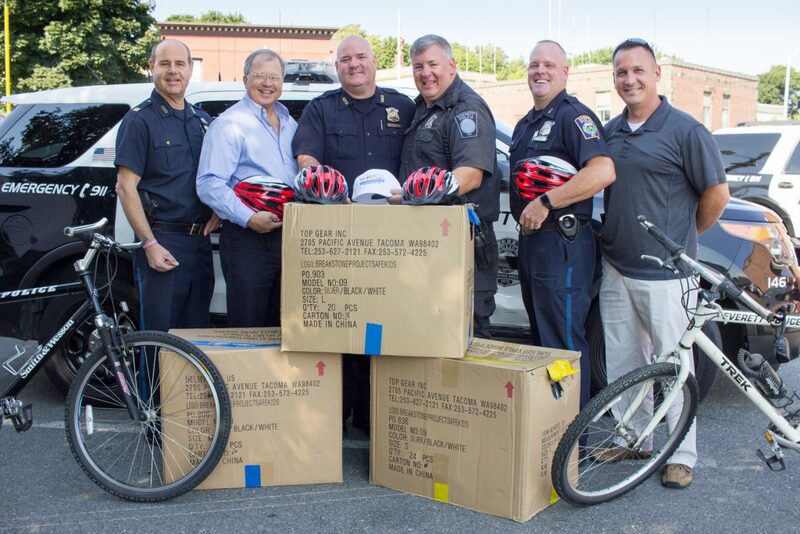 Now in our fourth year, we have proudly donated more than 10,000 bicycle helmets to children in the Boston and Worcester areas. This is our first year partnering with the Everett Police Department. We are excited about this donation because Everett Police have already started giving out helmets to children who need one. The department has very strong community policing programs for youth. Every July, Everett Police run a very popular Junior Police Academy for middle school students. This was the 15th year of the one-week program, which teaches its cadets about training situations through classroom training, hands-on police tactics and daily fitness and marching drills. This year, the cadets also got to visit the Coast Guard station in Boston, Breakheart Reservation and participate in diving operations. The academy is fun for the cadets and they get to consider police work as a career. During the school year, officers have a “Cops Corner” initiative and join high school students for lunch. Through the academy and other efforts, Everett Police have developed strong relationships with the community. We know officers will be able to put bicycle helmets in the hands of children who need them as we approach Back-to-School. If you are a cyclist or are the parent of a cyclist, visit our bicycle safety page. There is a video on the bottom, “Fitting a Bicycle Helmet,” by the National highway Traffic Safety Administration. With Back-to-School coming, now is a good time to check to make sure you have a helmet which properly fits and review the rules of safe bike riding with your family. Wearing a bicycle helmet is required by law for cyclists under age 16 in Massachusetts. But it makes good sense for all cyclists and if you are a parent, your kids are more likely to wear one if you do as well. It really is important. According to the bhsi.org website, almost three-quarters of fatal bike crashes involve a head injury. Study after study has shown helmets are the most effective way to prevent brain injuries if children fall or are involved in an bike accident. Through our Project KidSafe campaign, we have worked to prevent these injuries and are thankful for the support of Everett Police.